FULSHEAR, Texas - In a hilarious post to Facebook, Fulshear police outlined an encounter with an alligator in the Cross Creek Ranch area. 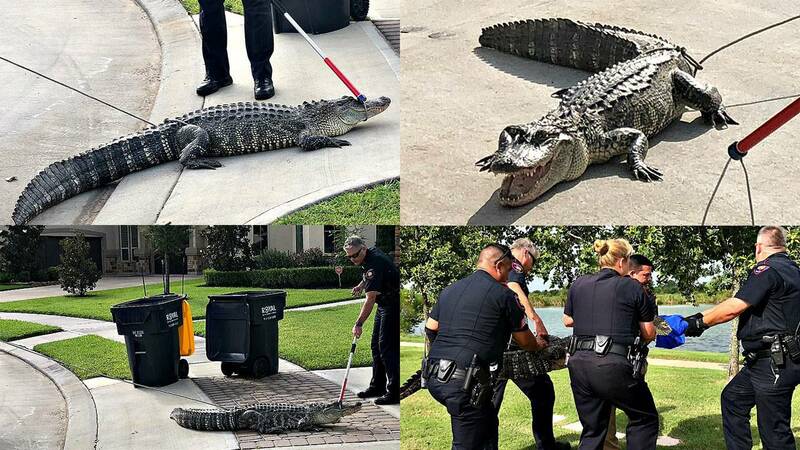 The alligator, described to be 7-feet-long, "thought joggers needed a little extra motivation" but was not aggressive, police said -- rather, it was just trying to catch some sun before heading off to enjoy the rest of its day. The gator was eventually captured and taken to a "'polishing pond' without incident," police said. "This morning a seven foot alligator thought joggers needed a little extra motivation as he was spotted inside the gator section…err…gated section of Cross Creek Ranch. The gator was not aggressive, nor was he pursuing the joggers, apparently he just wanted to get some 'sun action' before going about his business, whatever business that is, that alligators do. The 'big guy' got disoriented and ended up a little too close for comfort for some of the joggers. On the bright side, the runners did tell us it was their best run time ever. "Officers arrived to negotiate with the gator in an effort to talk him into moving to a safer location for both parties involved. The road to compliance was paved with good intentions, however, the road to the police-gator impasse was littered with failed peace initiatives. Forcing negotiations between the parties and laying out frameworks was not a cost-free exercise, particularly when the parties are not prepared to engage. Calmer minds prevailed and the alligator soon realized his attempts to escape were futile and was eventually forced to comply, not knowing the officers were only trying help his situation. "Eventually the gator was safely moved to the 'polishing pond' without incident, although we feel the gator may have a different opinion regarding the whole 'without incident' statement."